The news of recent high-profile art sales at Christie's and Sotheby's, with their multimillion-dollar price tags for a single artwork, got me scratching my head. 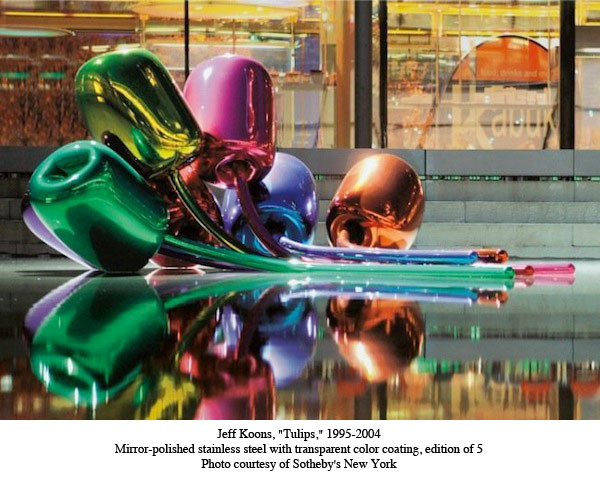 The ubiquitous Jeff Koons, whose shiny baubles are a "must have" for any newly-minted billionaire, was in the headlines yet again, this time thanks to the sale of Tulips, his monumental, multi-colored stainless steel sculpture. It was sold for $33.6 million. It was a record price for the work of this extremely popular, if critically polarizing, artist. While his early works continue to appeal to me, his last decade's factory-like output of screamingly banal sculptures has grown extremely tiresome. At the end of the day, I couldn't care less what today's billionaire collectors are wasting their money on. 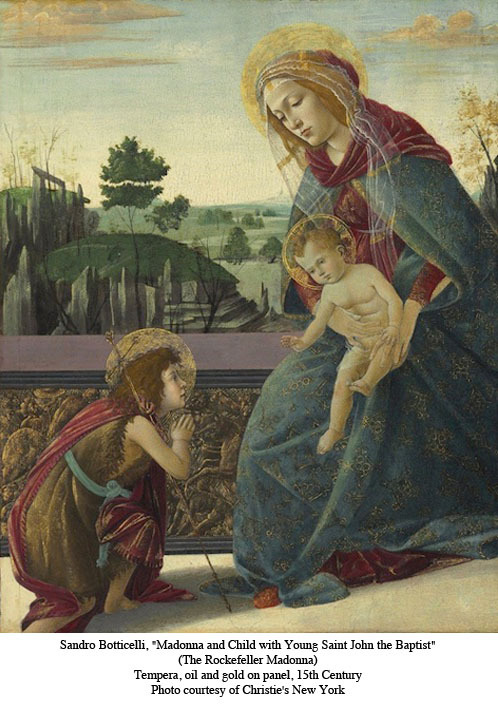 But what startled me was the fact that near the same time an extremely rare Italian Renaissance painting, the so-called Rockefeller Madonna by Sandro Botticelli, was sold at Christie's New York for only $10.4 million. When I asked some experts about the discrepancy in prices, I was told that this Madonna-- once owned by the Rockefeller family-- has been heavily restored due to its not very good condition. But for heaven's sake, it's still unquestionably a very rare Botticelli with a rather important history of previous ownership or, as art historians call it, "provenance." 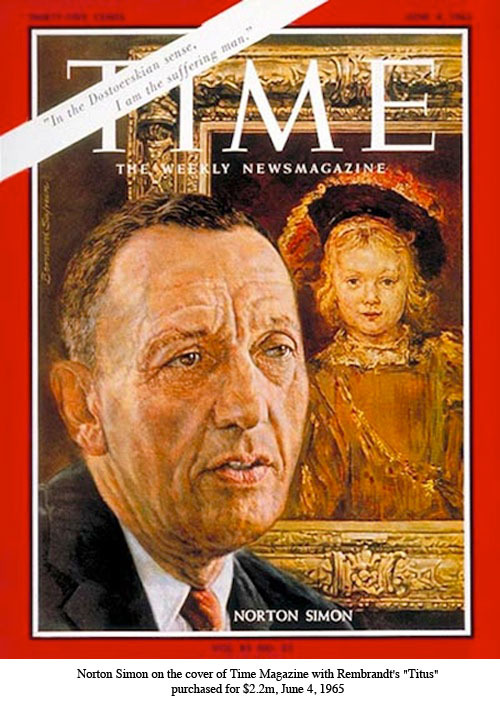 When, 60 years ago, Los Angeles industrialist Norton Simon purchased a Rembrandt portrait of his young son Titus for the then-staggering price of $2.2 million, it made headlines all over the world. I remember reading about it in the newspapers while still living in the Soviet Union. There it was a subject of ridicule -- this ridiculous American capitalist wasting so much of his money on a single painting. But here in the U.S, Simon and "Titus" made the cover of Time Magazine. And today, this exceptional Rembrandt portrait still shines brightly as the crown jewel of the Norton Simon Museum collection. 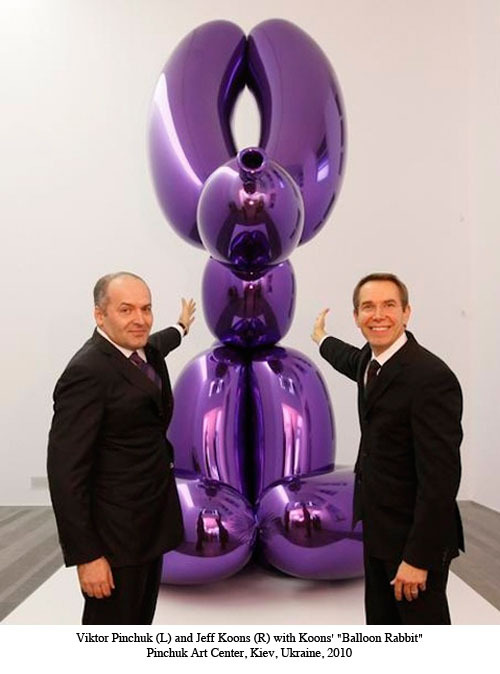 Somehow, I have my doubts that a half-century from now anyone is going to waste words praising Jeff Koons' "Tulips," acquired by Las Vegas hotel mogul Steve Wynn for one of his numerous casinos. The private collector who acquired the Rockefeller Madonna remains unknown, a longstanding policy honored by the auction houses. But rumor has it that it was one of the new Russian billionaires. 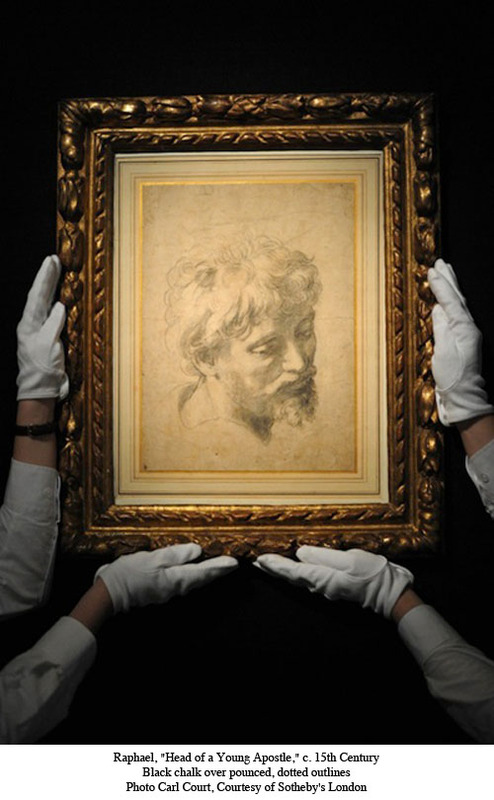 Could it be the same person who, just a month prior at a Sotheby's auction in London, purchased an extremely rare Raphael drawing, "Head of a Young Apostle,"
It's comforting to know that not all billionaire collectors are suckers for Jeff Koons. But most of them seemingly are. Owning one of his polished sculptures has become proof of belonging to some super exclusive club. I wonder sometimes why these collectors, so smart as businessmen, allow themselves to be seduced by the flashy works of Koons and his brethren -- Takashi Murakami and Damien Hirst, to name just a few. The problem, as I see it, is that those extremely successful and extremely busy people simply cannot afford the luxury of spending time to educate themselves about art world beyond the headlines of the last few years. Serious collecting is not just buying art, it's immersing yourself in art history, visiting museums, galleries and artist's studios. It's falling in love with and taking a chance on young artists before they become celebrities. All that takes time. A lot of time. And for the truly dedicated collector, this very process of learning and searching is endlessly rewarding. But today's mega-collectors, like Ukrainian oligarch Viktor Pinchuk, would rather be known for hobnobbing with art world superstars than taking a chance on some young, unproven talent. Who has the guts to tell Pinchuk that his collection is too predictable? Once I was invited to the home of an extremely well to do Angeleno couple who asked my opinion of their art collection. The collection was nothing to be embarrassed about, but it was more about their money and social position than their individual personalities and passions. I tried my best to be tactful, but it was clear to them that I was not impressed. My friend, who had introduced me to the couple, was mortified. She reprimanded me later, saying "Edward, you have to learn how to speak to billionaires." To which I responded, "My dear, they've earned their billions and I've earned my opinions." So if I were to give any advice to today's super collectors, it would be to invest time -- plenty of time -- and not just money, into building an art collection that will stand the test of time.